Oh, It's worth the effort. I have some 24V accessories I'd like to run. Besides, once I have the new alternator fitted to the engine, that'll leave space where the old one was for a second AC compressor to use for on board air. I'll hit the local cummins dealer and see if they can look it up for me. Oh, It's worth the effort. I have some 24V accessories I'd like to run. Besides, once I have the new alternator fitted to the engine, that'll leave space where the old one was for a second AC compressor to use for on board air. 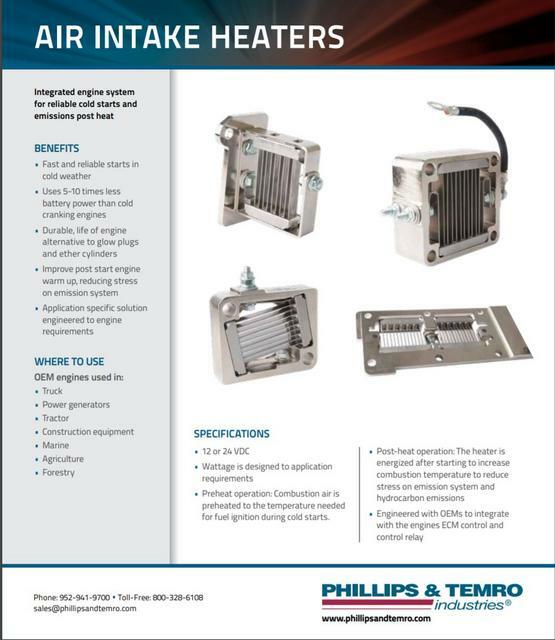 A company called Phillips & Temro Industries manufacturers the grid heaters that are used in the Cummins engine. They can be had in 12 or 24 volt versions. 24 volt parts are rarer and usually higher priced, one reason I'm going to remove all of the 24v items from my 5 ton 6x6 and convert it to 12volt. Years ago Kenworth used a polarity switch setup for 24 volt start and 12v operate. Starter was 24v, lights and accessories were 12v, not sure about the alternator. Sounds like a lot of work and messing up a good truck just to run a few 24v accessories. Are you going to swap out the heater blower motor, windshield wiper motor, all of the lights and relays as well, don't forget about the 12v dash and sending units. Think of the resale value or lack of it with a 24v hybird. I have converted 6 to 12 Volts, and 24 to 12, but would never consider 12 to 24. Having several 24 Volt vehicles, I know what a pain it can be to run regular accessories and attachments off their systems without punishing one of the two batteries. Of course, the ultimate cluster fs are my M1008 and M1031. One alternator for each battery, and everything except the starter is 12 Volt. Yes, I understand the reasoning (standardized 24 Volt communication systems) and have to admire the thinking that went into making it work. But keeping it working, and keeping the battery that supplies the 12 Volt happy, isn't as simple as it could be. Still, if forced to create a partial 24 Volt system, that's what I would reluctantly copy. Think of the resale value or lack of it with a 24v hybrid. I'm not concerned with resale. I'm driving this truck into the ground in another million miles or so. I hear you. I was considering that system, until I remembered the HMMWV system with a dual voltage alternator That way, all 24V runs off both batteries, and 12V punishes the the other, but the single alternator charges the batteries. That sounds like a simpler setup. One I've never tinkered with. Speaking of resale value. It might have dropped a bit when I cut 31 inches out of the frame to make my M1008 a more maneuverable tow vehicle/yard goat. That didn't bother me one bit, as I made my vehicle more usable for me. I don't quite understand your desire to have a 12/24 Volt system, you probably wouldn't want a really short pickup without a bed. We're even. Life is good. I don't know I drove a brand new f350 and it was the biggest piece of crap I've ever seen. I don't think I'm qualified to change a fuse in that truck. Id rather spend 20 grand on an old crap box and make it the way I want. some of our construction stuff has a 24v system with a 24v-12v step down box to run the cab. I don't know how many amps those things can set up to run but that might be a easy way to make your system work.